Beautiful 100% Argentinean cowhide bandolera bag. Crafted by hand in our uniquely tanned floral leather pattern with our rich caramel leather trimming its top, rear and its strap. Measures 9.5" x 10" x .5" (height x length x width). The strap is 46" which can be adjusted to a shorter length. 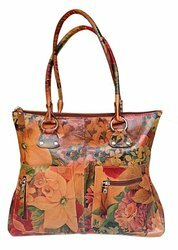 "Our Extra Large Bandolera bag crafted of our 'Victorian"" floral leather by the skilled hands of Argentine artesians. Measurements are 9.5"" 9.5"" x .5"" length x height x width) The strap is long, great for wearing 'cross body' for 'hands free' activities, measuring approximately 25. One of our best sellers! 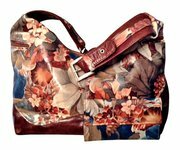 Hobo styled, 100% Argentinian cowhide leather in our very special floral design. Smartly configured interior design with two large separate compartments, divided by a zippered pocket partition. Two interior side pockets with a fully lined interior. Bag measurements are 16" x 10" x 6", width (side to side) x height (where shoulder strap connects) x base / bottom. "This little bag is a great compact size, not too small and large enough to fit a lot of 'stuff'! Made of Carpincho (Capybara) hide and trimmed with chocolate brown cowhide leather. 100 % hand made, 100% authentic Argentinean cowhide and 100% beautiful! Adjustable leather strap with front pocket and interior zippered compartment. One of our best sellers! This cutie-pie cross body style bag is crafted of 100% Capybara (akaCarpincho) animal hide and trimmed in fine Argentinean cowhide. Measures 6.5" x 7" x 3.75" (top to bottom x length x base) with an adjustable shoulder strap, for carrying either as a shoulder bag or in a 'cross-body' style. "Our beautiful, exotic and so hard to find, 100% authentic Carpincho / Capybara handbag is the perfect companion bag for all occassions! Measures 9"" x 8"" x 4"" (height x width x base) Back, bottom, shoulder strap as well as all the trim detail is crafted with rich chocolate brown Argentine cowhide. Traditional Style Dresses & Clothing for Kids - Children's Online Boutique Understated and elegant, our traditional styles are classic and timeless while our trendy looks always remain tasteful - find the VERY BEST at ADRIAN EAST. 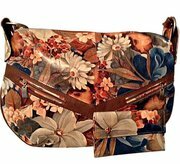 Children's apparel for boys and girls, newborn to size 16..
Our beautiful leather floral medium sized, cross body messenger bag is perfect for any busy life style or hands free activities! Crafted of 100% Argentine cowhide which has under gone a very special tanning process to create our signature floral patterned designs. Its Shoulder strap is easily adjustable, measuring 27” to as long as 54”. 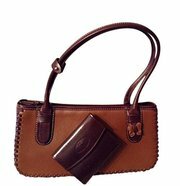 Pop Bag USA is the top women’s Mobile Phone Bags provider company in New York, USA. It provide as stylish as it is functional, the Cell Phone Pouches of Pop Bag Phone is a great way to store your phone when it's all you want to bring. A gold-toned chain even lets you wear it. It is Saffiano leather with a crosshatch finish. 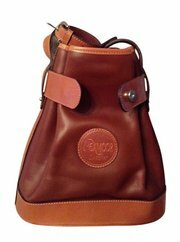 Carpincho Capybara leather exclusively from Argentina, S.A. Imported from Buenos Aires and crafted by the skilled hands of leatherme! This beautiful hide is durable enough to last for decades of enjoyment! It's incredible water resistant, scratch resistant, stain resistant, almost indestructible hide is unlike any other animal hide you may be familiar with. 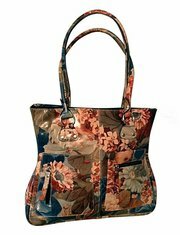 This handbag is perfect for that gal who needs a roomy bag without it looking like a carpetbag! Our beautiful tote styled designed handbag is also well suited for travelers and professionals. Measures 11.5" x 10.5" x 6" with two sets of straps. Rolled (for carrying comfort) grab handles with an 8" drop for carrying as a shoulder bag as well as an adjustable & removable shoulder strap, measuring 39" with buckles and side clips. 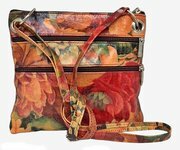 Our Denim Floral over sized baguette styled handbag has an extra special feature... a companion clutch / organizer style matching wallet! 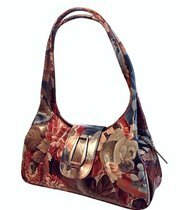 Handbag is large, measures 17" x 13" (width x height) with an adjustable shoulder strap. Strap will extend shoulder strap to 40" in length with its buckle hardware. The plus size bridal shops assist the curvier brides to experience a joyful and fulfilling wedding dress shopping experience. The renowned bridal shop - Designer Loft NYC offers plus size endeavors for a contemporary full-figured woman with exquisite taste. It’s the best bridal boutique that offers one-of-a-kind high style wedding gowns from size 12 to 44 completed with excellent workmanship, exquisite cut and fit and great emphasis on details. 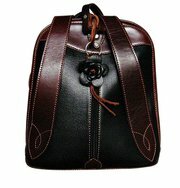 Beautiful, authentic Argentinean cowhide leather back pack, with an outstanding interior design! Adjustable straps for that perfect, comfortable fit so carrying is effortless. Designed with a rear zippered entry for quick access into main compartment. A smooth, secure, pocket free front panel for secure carrying! (pick pocket safe!) Its interior is divided into two sections by a zippered compartment and has an additional zippered interior compartment on its side. Argentine cowhide leather Ladies Handbag in our "paper bag" style design. Two tone caramel tan, Chocolate brown or Maldo (Rusty Brown) leather colors available, all with contrasting top stitching and extra long, adjustable shoulder strap. Measures 12" x 12" x 5.5" (height x width x base) And tappers to 6" when gathered closed at the top entry. Comfortable, lightweight, smart design with ample room and pockets for all your daily needs. Measures 13.5" x 12" x 2.5" (width x height x base) Rolled shoulder straps for hours of carrying comfortable. Generous front patch pockets with zippers & matching leather pulls, great style for all your quick access items. Absolutely brilliantly styled handbag for everyday use! Our unique, 100% Argentinian floral cowhide is totally handmade, stitched together by leather crafters Buenos Aires, Argentina. You can learn more about our uniquely different floral leather by clicking this underlined link. https://www.piecesofargentina. 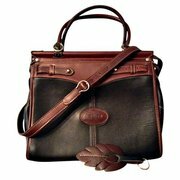 Beautifully crafted caramel tan Argentinean leather, trimmed with chocolate brown leather accents. Designed with one main compartment, a large zippered interior pocket and is handsomely lined with gabardine fabric. Top zippered entry into interior compartment with decorative leather zipper pull. Both double shoulder straps are 'rolled' for hours of carrying comfort! Straps measure 18" in total length with an 8" drop for under arm carrying. Handcrafted in Argentina, from where all the best cowhide comes from! 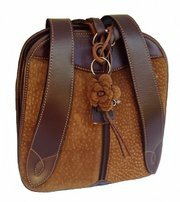 This yummy caramel tan, calf hide handbag is an absolute beauty! It's the only one in this model and color, what a pity! But what a find while in Buenos Aires! Measurements are large, 18 "x 13" x 6" (width x height x base), with a double rolled hand stitched shoulder strap of 15". 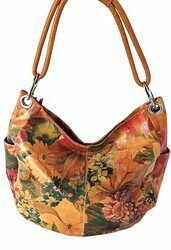 100% Genuine Argentine floral leather hobo styled handbag purse. Measures 13" x 17" x 10" (height x width at center x base) The width of this bag tapers from 15" at its opening to 17" at its center x 10" at its base. 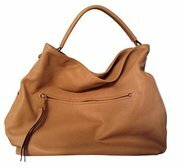 Soft sided hobo style with large pockets on each exterior side. Carpichco / Capybara and cowhide leather back pack. Beautiful with an outstanding interior design. Adjustable straps for that perfect, comfortable fit, a rear zippered entry and smooth, secure front panel. (pick pocket safe!) Its interior is divided into two sections by a zippered pouch and has an additional zippered interior compartment on its side. 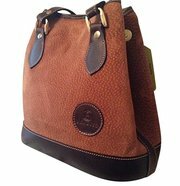 This very special bag is made just for the equestrian in mind. Hand crafted by the skilled hands of Artesians in Buenos Aires, Argentina. Thick cut harness leather is used for its entire construction, along with solid brass, heavy hardware. Interior has one main compartment. 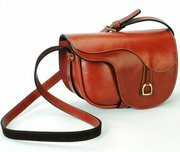 The extra long shoulder strap is adjustable with brass buckle. Women's solfit jacket & pants set is the best apparel designed with cutting-edge technology that comforts you while you safely & responsibly sunbathe in cold weather. The best way to get sun naturally in cold and windy environments while staying warm. Engineered with SolFit UVTR fabric. To know more - soltechapparel. 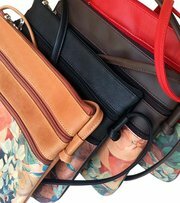 Our beautiful handbags are expertly crafted by the skilled hands of leather Artisans in family businesses that have done so for decades of generations. They use age old techniques which have been passed down through generations of the family. Each bag is individually pieced together, sown and crafted by hand, one bag at a time. Ah! Fashion is at its best with Andrew Lincoln the Walking Dead Rick Grimes Jacket. This exciting jacket was worn by your favourite character Andrew Lincoln in his movie Walking dead. The Walking. Explore an unmatched collection of designer wedding silhouette from best bridal salon NYC. We house a handpicked selection of wedding gowns and accessories for beautiful bride, who wants to adore a significant look on their special day. Designer Loft is one-stop destination for them. We cut, craft and create the most stirring wedding gowns to mesmerize everyone out there. Clothing for sale, accessories New York classifieds, New York ads, New York classified ads, garage sale New York Page number 5-1. Find here ads for sale, to buy and rent in New York. Goods for sale in New York, vehicles for sale in New York, New York real estate for sale, New York property for sale, property for rent in New York, business ads in New York, New York business classifieds, services in New York, New York services ads, jobs in New York, pets for sale in New York, New York dating, New York cars for sale.